Enjoy your poker party and play on a casino-like playing surface using this Texas Holdem Folding Table Top. 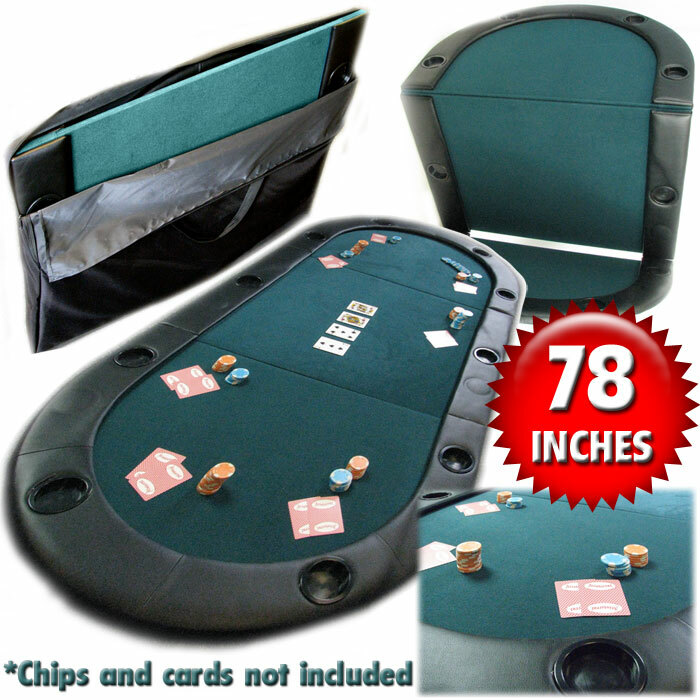 This brand new folding light-weight casino-quality Texas Holdem Folding Table Top is made of quality foam and felt. Thick water-resistant padding provides hours of comfort during play. Thick soft nylon wrist/arm rest surrounding the table 10 cup holders. Casino quality green felt material provides a smooth playing surface. Vinyl bottom to protect tabletop. Dimensions: 78 inches length by 36 inches width Easily folds for storage Includes heavy duty nylon/vinyl carry bag with a double strap handle for convenient transport .